As I first spied the LARC through a window parked at the loading dock in the rear of the building, I watched the video chronicling its journey through downtown Nashville on a nearby monitor. 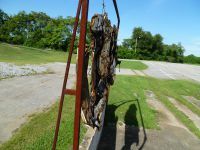 Immediately afterward I went to the front office, knowing I had to get a copy of this video and more pictures to share. I was delighted (and amazed) that Rex Bennett, Lane’s Education Director, is actually an avid reader of our esteemed site and knew my name! He immediately dropped everything and offered to take me on a personal tour of the LARC (as well as all of the other treasures contained in Lane’s basement that are not usually available to public view). So off we went. The first thing that struck me about the LARC is its sheer size. The tires are 9 feet tall. When I first saw it I thought it looked big but I was some distance from it and didn’t realize at first that it was actually parked in the well of a loading dock that allows semi-trailers to offload flat into the warehouse. The top of the wheelhouse appears to be almost as tall as the building itself. Sure, it’s small for an oceangoing vessel but positively enormous for a wheeled vehicle. I’m glad it wasn’t just parked in the middle of the lot as it would then be much more difficult to judge its size. LARC is short for “Lighter, Amphibious Resupply, Cargo” and the LX part of the name does not denote the trim level like on a Honda Civic, but rather the Roman numeral for 60 as in 60 tons. 60 tons was the maximum rated load but just like with Paul’s F-100 pickup, loads are/were frequently much, much heavier than the official rating. The main mission purpose was generally to drive it into the water from an on-land position and then load it from a ship with supplies, troops, or artillery etc. and then return to land. 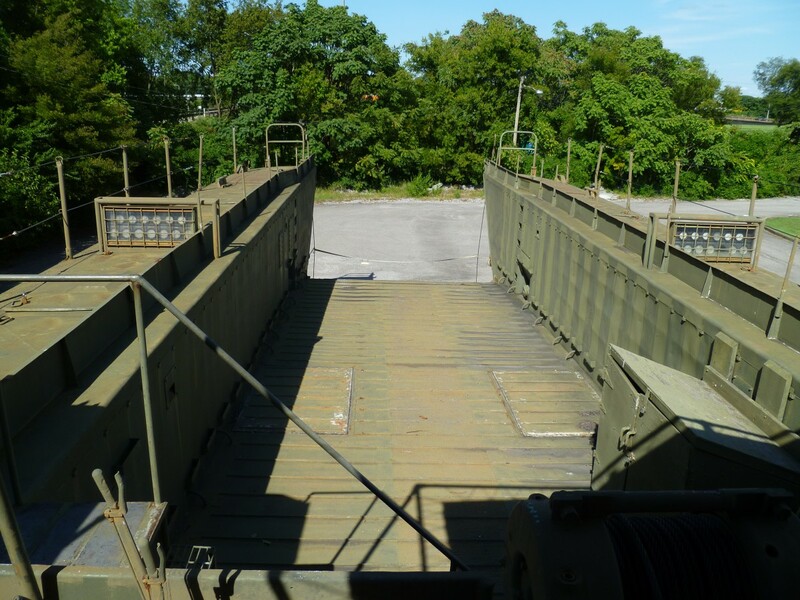 LARCs were transported to the theatre on heavy container ships, or LSTs, offloaded, and pressed into service. Rough seas were not a problem and it could apparently climb very steep gradients. 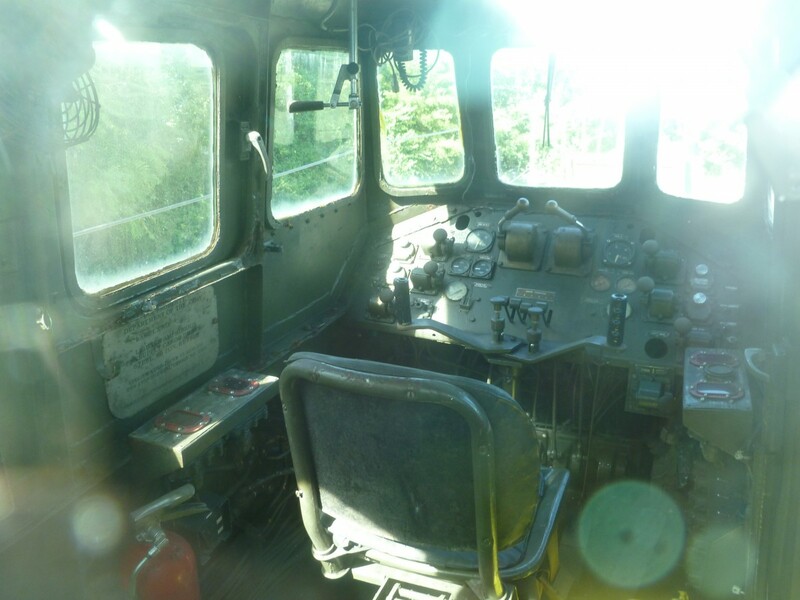 With this example being a 1959 version and one of between 60 and 100 produced, it most likely saw action in Vietnam; among our readers I’m sure we have some that may recall these from their time in the service and perhaps we even have someone with some practical experience aboard one. 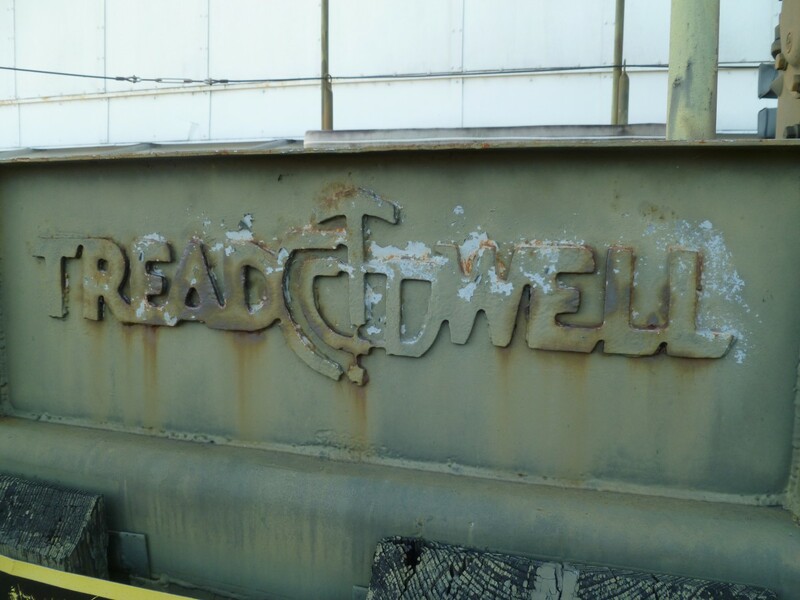 LARCs were built by several different shipbuilders including Treadwell Construction Company of Midland, Pennsylvania. The museum is fairly certain that theirs hails from a shipyard in Mobile, Alabama. The LARC is 62 feet long, 26 feet wide and almost 20 feet high. 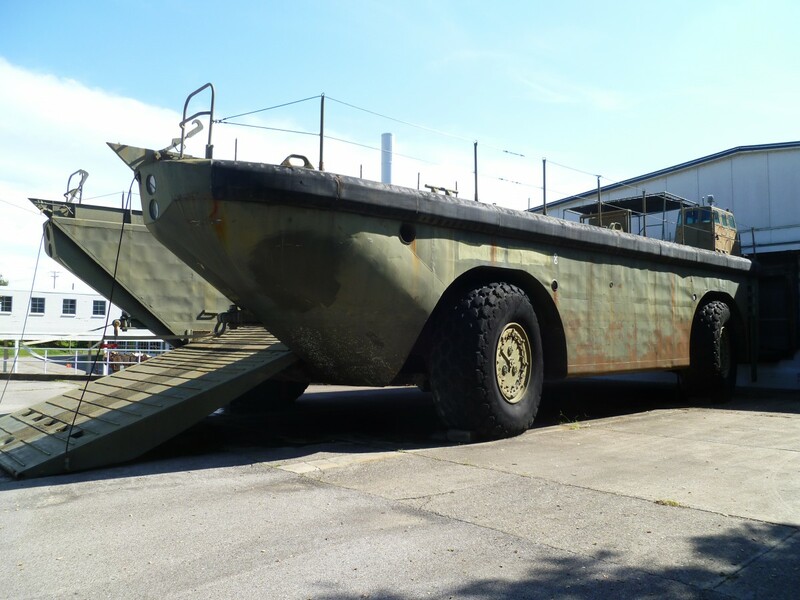 It weighs around 100 tons and was the United States Military’s largest amphibious craft. Each wheel/tire is powered by its own 6 cylinder Detroit Diesel NA6-71 engine with a 3-speed automatic transmission, so it is 4WD and can be steered with either two or all four wheels at once. On dry land the top speed is 16mph, on water around 7 knots using twin 48″ propellers. The bottom is flush, with the only penetrations into the hull being the wheel assemblies as well as the propellers and rudders. Range on water is approximately 75 miles, on land approximately 150 miles. 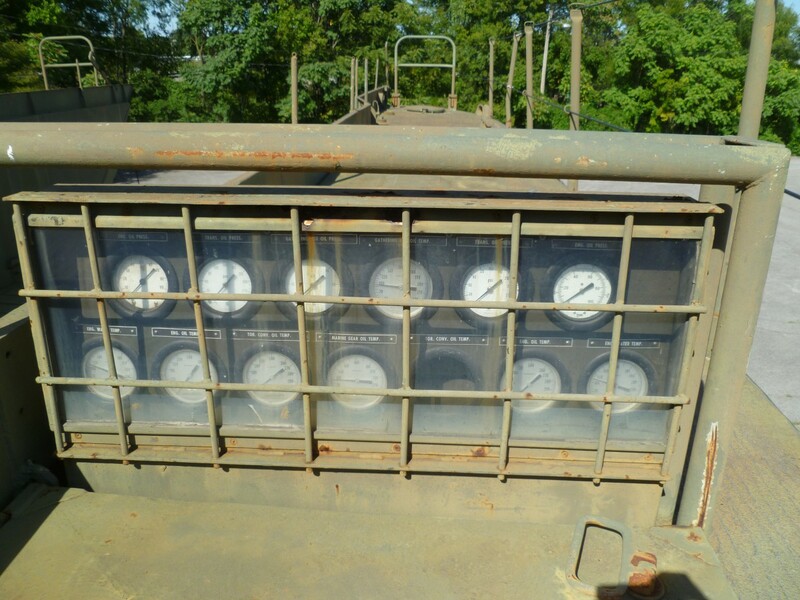 The fuel tank holds 600 gallons of fuel. The museum calculated that their gas mileage was approximately ten gallons of diesel fuel for every mile traveled through downtown Nashville from the water to the museum. 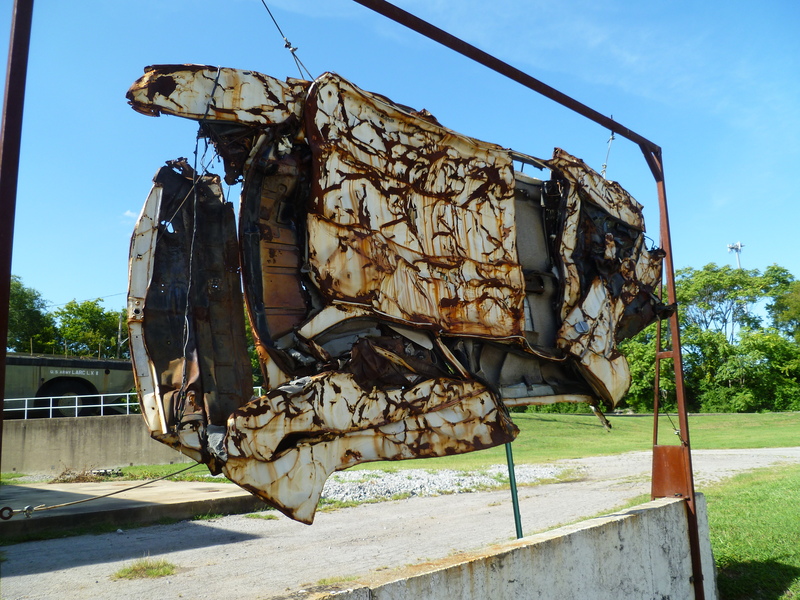 Lane Motor Museum acquired their LARC in 2004 and moved it from its location in Stuart, Florida to their museum in Nashville. When the museum found it on eBay it had been used for home construction in Trinidad. The video above chronicles the journey and is extremely interesting to watch. I am indebted to Rex for convincing the museum to post the video to YouTube this week so that I could easily share it with you. Since being “docked” at the museum, it was used regularly for display events and driven around the parking lot and used in demonstrations by running over unusable empty car hulks (I made sure that no viable Curbside Classics have been harmed during these demonstrations). However, several years ago an E30 series BMW (think mid 80’s BMW 3-series) got its revenge by poking a 25mm (about 1″) hole into one of the LARC’s massive tires. 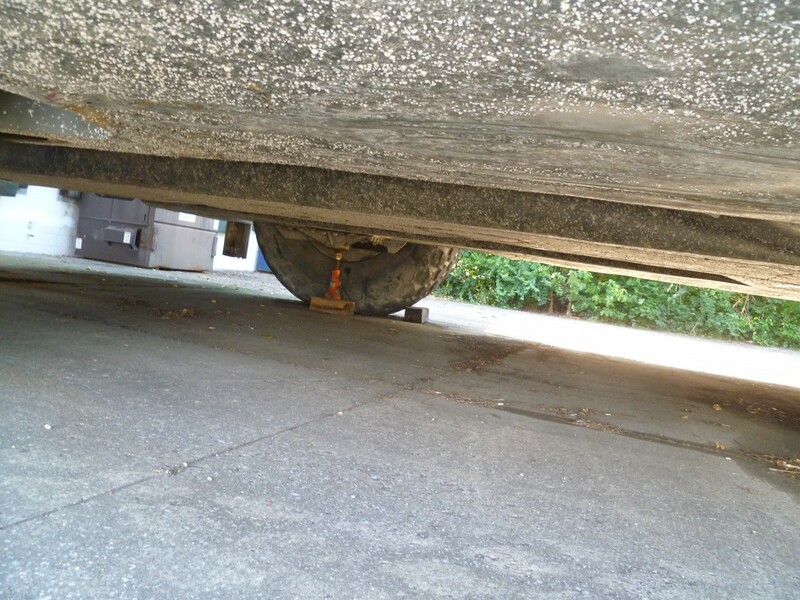 Currently the LARC is parked on jack stands and immobile while efforts to secure a replacement tire at a reasonable price continue. Being able to walk around and on the LARC was amazing, usually it is roped off to visitors. We popped open one of the topside hatches so that I could take a couple of shots of the mechanicals (well, one of four sets of mechanicals actually) and then looked at the wheelhouse. It must have been quite a task to drive one of these in wartime conditions with a crew of three (pilot, engineer, and load specialist). 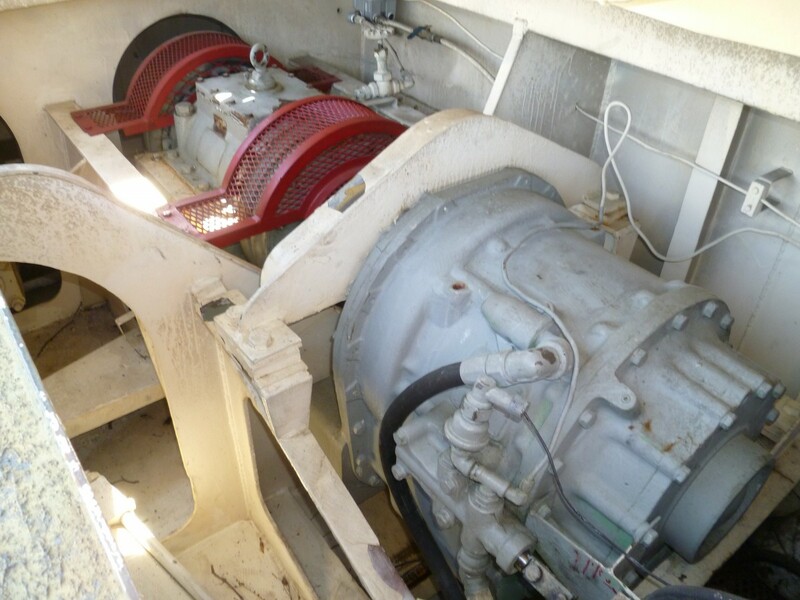 Each engine has its own set of gauges and the wheelhouse seems very exposed but not really able to give a very commanding view. The best view is surely from atop one of the leading edges of the bow as seen in the video, although the rear has a nice tarp to provide shade while cruising around the Gulf of Tonkin. Or a parking lot in Nashville. Neither fish nor fowl but built for a specific purpose, it seems that it did its job admirably for many years and now serves as one of the museum’s most distinctive and engaging displays. I thank the fine folks at the Lane Motor Museum for the access they provided me and encourage all of you to visit if in the area. I believe that we have a tie for largest Curbside Classic. 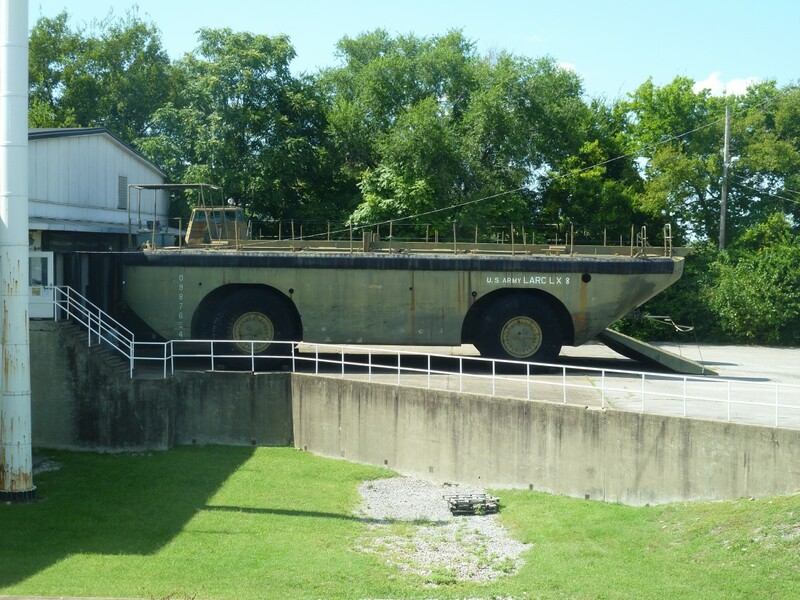 Last year I profiled the 60-ton BARC 3-X (Barge, Amphibious Resupply, Cargo), apparently a prototype of the LARC LX, found at the Army Transportation Museum in Fort Eustis, Virginia. I wonder how many of either of these are still in existence. Also, you got to climb inside and look around, while I just gawked at mine from outside. You got the better look! 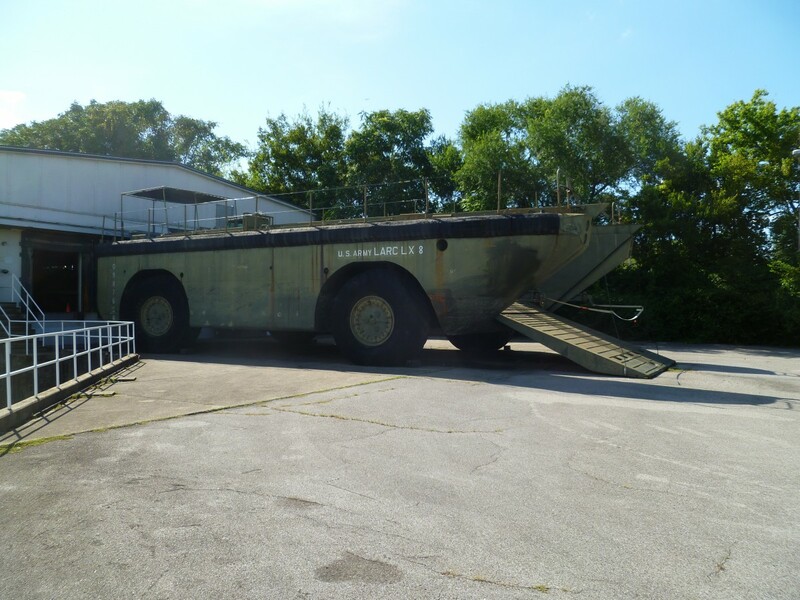 The Army Transportation Museum describes its BARC as being designed and made by LeTourneau of Toccoa, Georgia, but this LARC LX apparently had a different manufacturer. Given the small numbers made (4 prototypes, 55 of the final design), it makes one wonder what the production arrangement was. Economies of scale seem to conflict with spreading 55 vehicles/vessels among multiple manufacturers. In researching this I found several disparities, including number built, I saw 60-100 in a couple of places and also the 55 number that you cited. There were several manufacturers cited in addition to LeTourneau, I found Treadwell being the main one but also Great Lakes Engineering, MI, and Transval Electronic Corp.
Of course I have no idea if the various sources cribbed from each other as far as their data goes. Also, I don’t know enough about wartime (?) construction to speculate if a common set of plans were sent to different manufacturers/builders to build but I assume so. I suspect it wouldn’t be difficult to coordinate as long as there was a central spec to adhere to and to source the common variables from (engines, transmission, tires, etc). It’s not like these were popping out of a mold or anything, I’m thinking more like a ship with a relatively long individual production cycle between serial numbers. If anyone knows for sure I’d be interested in knowing more. I had Lane Motor Museum proofread the post (and incorporated several changes) but even they admit they are very interested in verifiable corrections to any data presented here. Does the Museum have logbooks for Army vessels? Contrary to popular belief, our archives do not contain logbooks for all Army vessels. Our collection does include the “vessel data” page and crew lists for SOME small craft. The majority of this collection is dated from 1970 on, and includes Small Tugs (ST), Large Tugs (LT), Landing Craft Mechanized (LCM), Landing Craft Utility (LCU), Logistic Support Vessels (LSV), and a few other small vessels. Most of these are for vessels that operated here at Fort Eustis out of 3rd Port. There is something endlessly fascinating with gigantic movable machines, especially when you can see them run (even if on video). This is super-cool, and I look forward to reading more about your visit to the museum. It is also kind of fun being associated with CC – I got a VIP tour of the Studebaker Archives that are maintained by the Studebaker National Museum awhile back, which will also be the subject of a future writeup. Looks like you got better pictures than I did. I went there one day and wandered out back on my way home. They also use it to crush the occasional car. I think this was the largest crowd I’ve ever seen there. CRUSH that BMW that put a hole in the tire! That sickens me. Crushing an NSU!!!! StaceyDavid of “Gearz” shows an NSU being crushed as well. 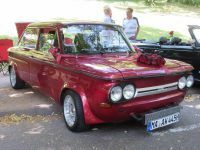 Them NSU’s are CC’s, for crying out loud! I could proclaim many obscenities upon seeing this Larc just in photos but in person I think I’d be speechless. It was really cool they let you board it and check it out. While I haven’t played the editor card it certainly appears I should at some point. What a find! The first picture looks like it’s ready to pull the building away – which it probably could. This is quite fascinating and I’m looking forward to watching the videos when I get to a computer. These a town called 1770 (for real) that runs tours with a pair of LARCs. We did it back in 2003 & throughly enjoyed it. Yes, I think those are LARC V’s – the 5-ton version. We have Ducks (DUCW’s) over here in many coastal cities (San Francisco, Seattle, etc) that do something similar. It is fun and the kids love it. I think one capsized a few years ago somewhere east or south (Alabama? Kentucky?) and there were some unfortunate drownings in that instance. This is what you were thinking of. I lived in Hot Springs for a long time and these were cruising the lake every summer. Thanks for sharing, the Lane Museum is truly worth the effort to get to for any odd (by American standards)car lover. Rear engine air cooled Tatras – they have several. Citroen’s galore, including an SM. Mr. Lane is a seriously cool guy as well. It would make an excellent venue for a CC meetup. Wonder how many ’59 Lark VIs would fit in a ’59 Larc LX? I’ll bet it would come out just right: LX/VI = X.
I think you may have their design figured out. A Lark likely wouldn’t be too much bigger than a Jeep of the time. There was a amphibious jeep once upon a time like a junior DUKW. What a cool device, I had a feeling we’d seen it or a cuzzy before but quite an awesome weapon on city streets. Unless the photo is deceiving, this LARC is sitting on a bottle jack about the size of one in my garage. Wow! Once the soccer moms discover these, the Hummer and Escalade will be so last year’s model. Great article – looks very similar to the Arctic Snow Cruiser of 1940, but the LARC is still a little larger. Now that’s one cool vehicle. I never heard of these before, but am very familiar with the DUKWs, having ridden in one at the Wisconsin Dells with the family back in the mid-80s. Now those things are all over the place – even here in Cincinnati! Great article, and I will have to check out the Lane Motor Museum next time I’m near Nashville to see this for myself. Another related vessel that’s interesting to see is the LST-325 — an example of the ship that transported the LARC. There are only 2 left (out of thousands that were made), and the 325 is usually displayed in Evansville, Ind. From what I recall, a private foundation bought this example from the Greek Navy in the 1990s, and sailed it back to the US with a crew comprised largely of WWII veterans. I toured it when it stopped over in Alexandria, Va. in 2001 (I think), and eventually it made its way to Indiana. I believe it still takes voyages to other cities, too, so it’s really a working vessel, and one with a neat history. And I thought the Terracruzer that hauled the Mace missle on its launcher was big. 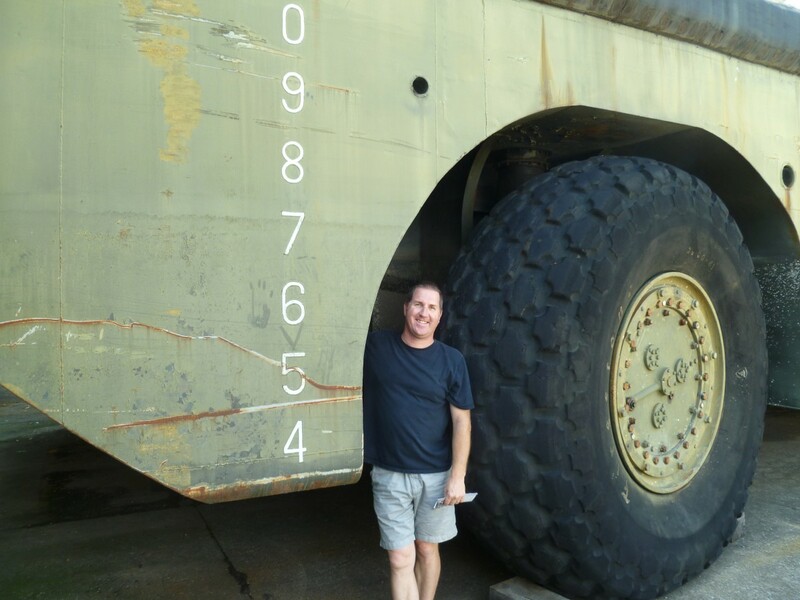 I believe the giant wheels and tires from that Snow Cruiser were used on one of the original Bigfoot 4×4 monster trucks in the 70s…if you have never been to Bigfoot’s offices in Hazelwood MO it can be an interesting thing to visit for 15-20 minutes and just gawk at those monstrosities. After rotating to the states from my overseas assignment I spent a year with these big green machines. Back in 1972-73.with the 503rd Transportation Plt., Fort Story, Va. Unit inactivated , never got in touch with any of the guys. Pictures of scrap is a sad end.